This month, I went on vacation with my family, to a lakefront rental in the Poconos, PA.
We all look forward to our vacations together each summer. We've become real pros at relaxing & enjoying our time off. We have great stories and memories from our many vacations over the years. I've been posting some of the photos I took during the week, mostly nature scenery & crazy things I saw in our travels. 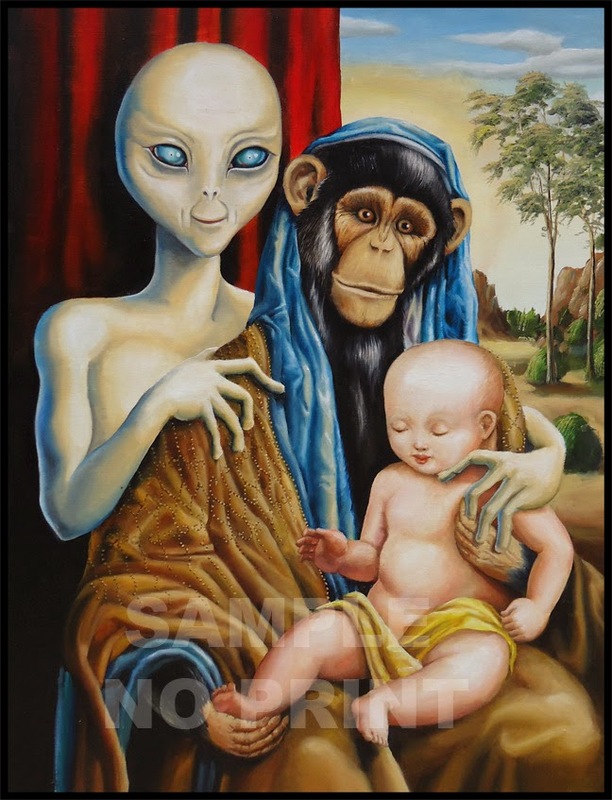 Usually, I don't post stuff about my family on this blog, but I wanted to include the official family vacation photo with everyone in my immediate family. These are the most important people on this planet to me, & I'd like to think I'm preserving their memory on the Google servers, for posterity. Perhaps our memories will continue on into the far future, even as the Internet inevitably continues to develop into new forms. As humanity & our global information network one day moves beyond Earth into space, hopefully at least the digital remnants of our lives will survive into the future & among the stars. Last week I went on vacation with my family, to a lakefront rental in the Poconos, PA. This year we stayed at a new house. It turned out great, & my whole family had an awesome week. We didn't really do too much other than eat, drink, hang out by the lake, & go out on the boats. In the beginning of the week, we went to a huge flea market. There, we had our traditional contest to see who could purchase the best 'prize find' for under $5. The only other day trip some of us took was to the scenic Hawk Falls trail, which is near Hickory Run State Park. It is a short hike of about a mile that ends up at a beautiful waterfall. It's an easy enough hike that we can take my nephews when we go. I go almost every year & it's picturesque location never gets old. I added some pics from the hike & the waterfall to my photo album. I've added photos to my Poconos 2014 album of the beautiful scenery that I observed & enjoyed on the lake that we stayed at. It was truly refreshing to be in a natural setting, cut off from technology & social media. I love the outdoors, and spent my time kayaking, fishing & just relaxing by the lake. On the weekend we get there, we usually go to a gigantic flea market for part of the day. Now, I carefully scour tables & boxes when I'm looking around... trying to find that one thing that stands out above the others. My Mom asked me what criteria I used to pick my "Prize Find", but I just know it when I see it. I've started my Poconos 2014 album with "Flea Market Finds". My "Prize Find" is in the album below, click the link to see more pics of other insane things that were for sale. Nikola Tesla was an inventor who was one of the greatest thinkers of the 20th century. I've posted about Tesla here several times. The more I learn about his visionary ideas & theories, the more I realize what an absolute genius he was. 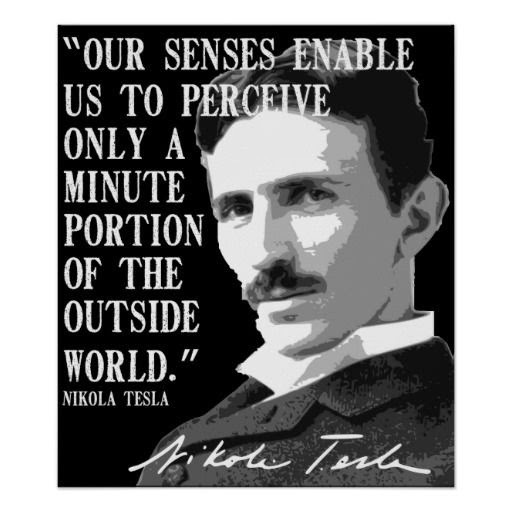 Besides his tangible achievements, such as the invention of alternating current, radio transmission, and early x-ray imaging, Telsa also worked on advanced technology that is only becoming fully realized in modern times. He proposed beam weapons & wireless transmission of electricity. 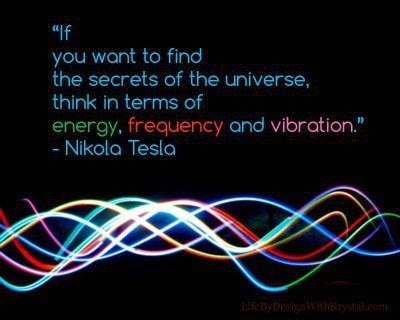 Telsa's most important theory, in my opinion, is his theory that electric power can be extracted from the quantum field interpenetrating all things throughout the entire Universe. This is the zero point energy source that will make all other forms of energy production obsolete. 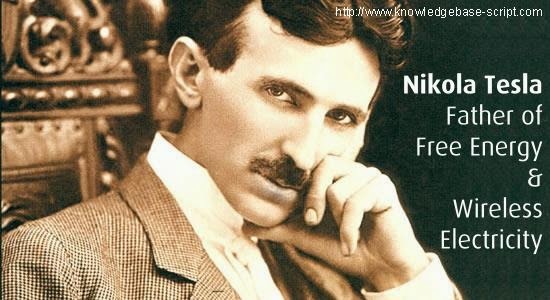 Yesterday was Nikola Tesla's birthday & his name lives on, thanks to the ongoing appreciation people have for his work. Elon Musk, the billionaire who founded the electric car company bearing his name, Tesla Motors, donated $1 million to the future Tesla museum, at the site of his Wardenclyffe laboratory. I don't have a million bucks, so I'll honor one of my intellectual heroes by posting some of my favorite Tesla quotes. 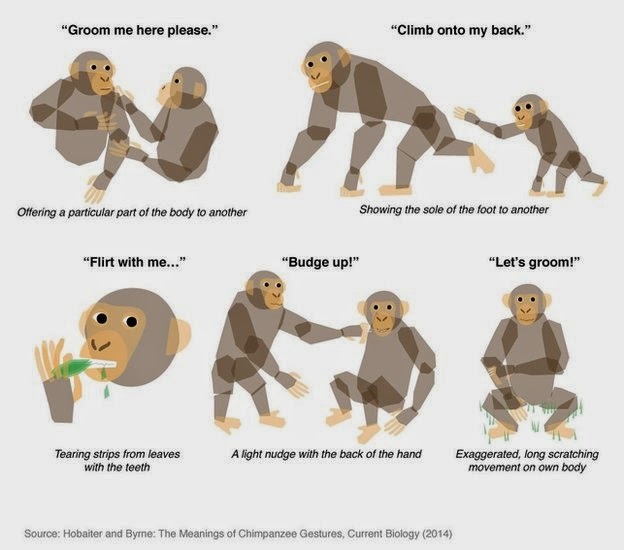 and can drive the world's machinery without the need for coal, oil or gas"
I came across this article about a paper outlining the gestures used to communicate between chimpanzees. Humanity has generally assumed that other animals are incapable of meaningful language. Like tool-using, complex communication is one of the characteristics that we like to think separates us from "lesser" species. However, the more we learn about the animal kingdom, the more we realize that these behaviors are not so unique to humans. Many animals, especially mammals & primates, have been found to use tools for complex tasks. More difficult to prove & decipher is the use of "language," for meaningful communication between members of a given species. With more study, this is also being shown to be a trait other animals possess. Humans may have the most detailed and abstract use of language, but any living intelligence has the capability of experientially connecting to other living intelligence. As we learn more about the rest of the life that inhabits this planet, we will continue to decode the languages of animals, and even non-sentient lifeforms such as plants. Perhaps there will eventually be software for us to translate these non-human languages, so we can begin to understand the inner worlds of other beings. The entire living world is talking... we just don't know how to listen. I am currently reading an e-book from NASA, about how we would communicate with alien beings. If we can't even understand other life from our own planet, it would seem to be just as difficult to try decoding messages from another world. "Archaeology, Anthropology, and Interstellar Communication"
One of my favorite features of video games is the ability to customize your "avatar," or the character you are virtually controlling onscreen. I've been playing Saints Row IV, which is a ridiculous & fun open world game. It has endless choices for making your character appear however you want him or her to look. With the emergence of more effective & immersive virtual reality technology, the human mind will be open to all kinds of novel sensory experiences that could not even be imagined previously. You will be able to assume any form you want, & perhaps even experience consciousness itself in new ways. The question remains whether this VR technology will help to expand the mind's capabilities, or imprison it in a digital "light labyrinth". This is a great Onion spoof on the endless customization options available in certain games when creating a virtual being. In my last post, I linked to articles about the Hubble Telescope's view into the infinite expanse of cosmic space surrounding us. How can human beings, in our current physical incarnation, ever hope to travel over such impossibly vast distances? People are dreamers & explorers by nature, so it's no suprise that humanity's brightest minds are at work on solving this seemingly insurmountable problem. 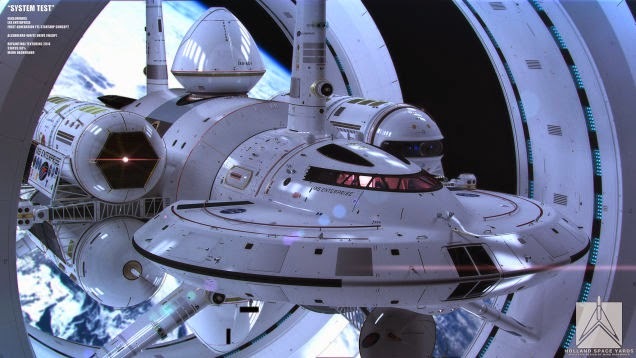 The most promising answer so far relies on some sort of "warp drive" Such a propulsion system would warp space-time itself around a vehicle, to allow it to bypass the relativistic effects of traveling close to the speed of light. Like many precursors to modern technology, this is a concept that has been explored in sci-fi, like the classic Star Trek warp drive. Another example is the excellent video game Mass Effect puts you in a future scenario where Earth has joined a galactic civilization, connected by "mass effect" technology that warps gravity- allowing faster-than-light (superluminal) speeds. 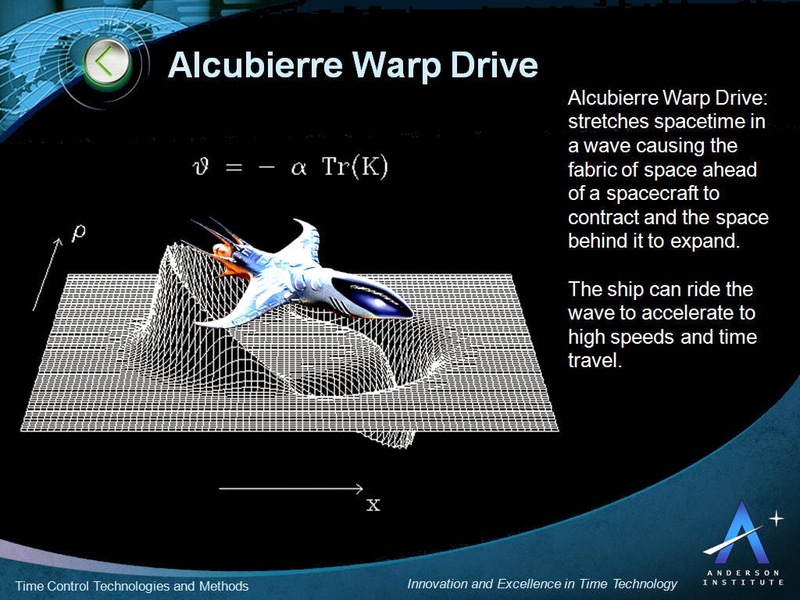 Interestingly, a warp drive is how Bob Lazar claimed alien UFO technology worked. Lazar was an engineer who came out with information about Area 51, where he said he worked on reverse-engineering alien craft. 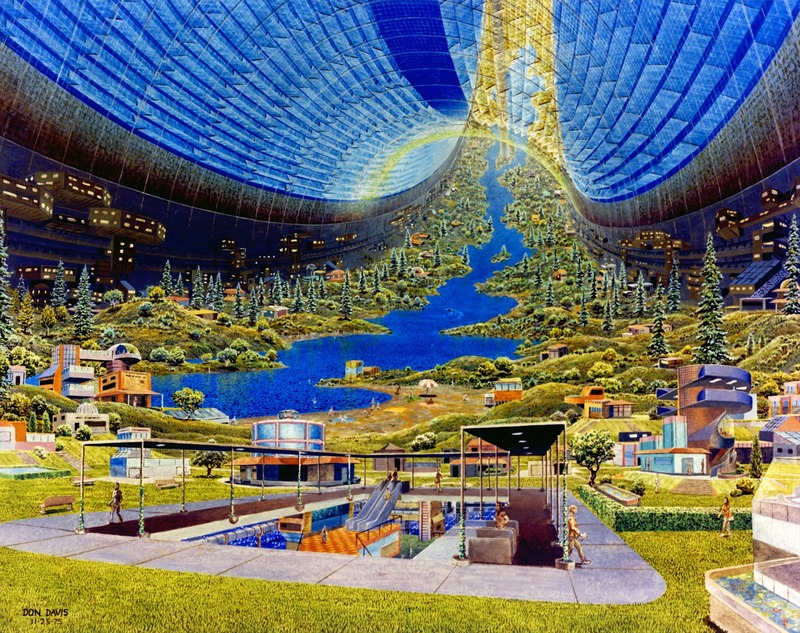 Here are some articles on the advancement of humanity's attempts to develop interstellar space travel. The Hubble Space Telescope is one of the most mind-expanding pieces of technology ever to be created by humans. It has allowed us to view breathtaking glimpses of the vast Universe, that forever changed our perspective of the reality we live in. The rich, dense views of distant star fields that have been imaged by Hubble are just tiny spots taken from the cosmos surrounding us. Each of these little slices of the cosmos that Hubble captures shows thousands of galaxies, containing millions of stars each. 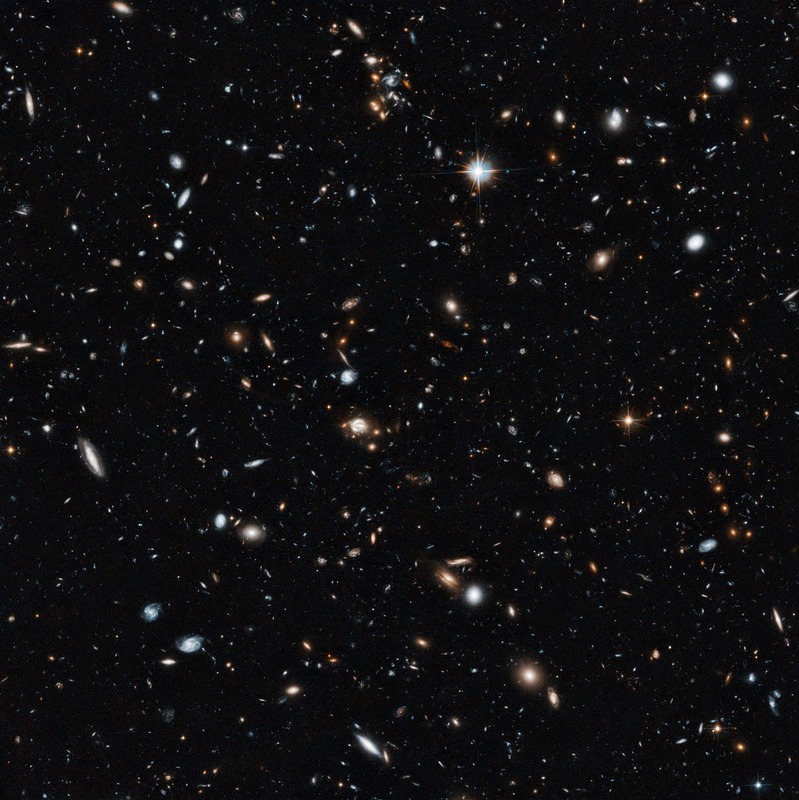 When we look at Hubble images & really ponder them, we are gazing into infinities upon infinities. All sense of ego & self-importance is utterly dissolved in the presence of such incomprehensible vastness. 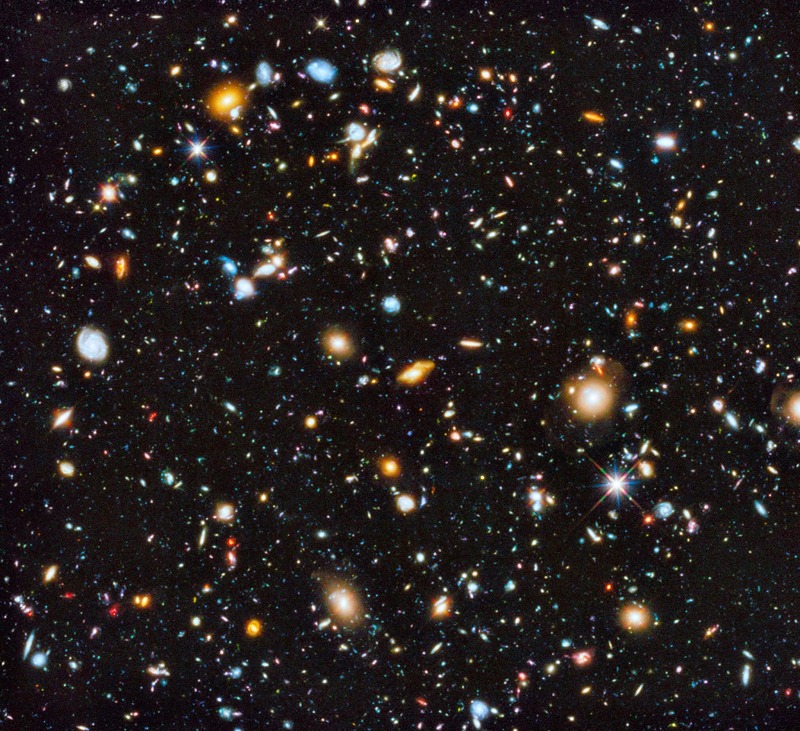 Here are some articles about recent images that Hubble has captured, revealing the practically infinite nature of our Universe.